On July 20th our very own Lisa Malone set off on a gruelling cycle that would take her from Daventry to Paris. Cycling as part of the Daventry Cycle Club Lisa raised over £1,000 for Cancer Research. 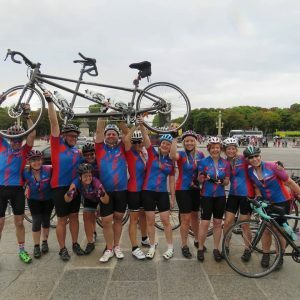 Cycling with another 38 members, Lisa describes how they rode through ‘hills, potholes and French traffic’ to reach their goal of Place de la Concorde. Not always a cyclist, Lisa caught the bug due to her husband’s diehard love for the activity, she jokes, ‘I can now be found lying on tarmac all over Northamptonshire and Warwickshire’, as she now swaps clothing orders for biking gear. Covering an astonishing 280 miles in just three days, Lisa’s achievement and support of Cancer Research demonstrates just how life-changing taking up a new hobby can be: she only started cycling in February and has already proven herself as quite the pro. Lisa’s training was intensive, including cycling between 30 to 70 miles at least 3 times a week, and required a huge amount of commitment and dedication. 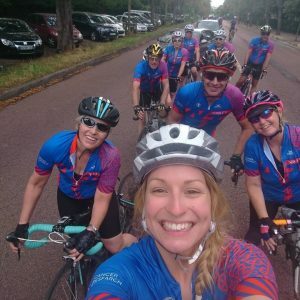 Lisa explains that despite the lengthy and demanding cycle to Paris, it was this prior training which was the biggest hurdle stating, ‘It was the months of training leading up to the ride that was the greatest challenge’. However, through her hard work and perseverance she was able to complete her training and reach the Place de la Concorde within her time goals; a huge credit to her. While people cycled and fundraised for various charities, Lisa did so to raise money for Cancer Research. Cancer Research does essential work into searching for cures and treatment for cancer, and fundraising such as Lisa’s allows their vital work to continue. You can still donate at Lisa’s Just Giving page. Lisa’s cycle can be likened to a business journey, there will be ups and downs but a clear goal combined with hard work, perseverance and the right support will get you over the finishing line. If you are in business and would like to work with an accountant who will come along for the ride then contact us today, we have offices in Daventry, Northampton, Rugby and London. Are you being targeted by email scammers?